The DL-103 I need for the preamp test does best in high mass arms. I have a low mass ADC LMF-2 arm. The LMF-2 has 6 grams effective mass. These two are not an ideal pair. The DL-103 has 8.5 g mass and dynamic compliance (@ 100 Hz) of 5*10^-6 cm/dyne. Based on the spreadsheet here the Fo calculates to be 18.7 Hz. If I add a 3 gram shim that lowers to 17 Hz. To get to 14 Hz I have to add 10 grams. I don't have the complete counterbalance weights for the LMF-2 either. An AT-F3/III with only a single 3 gram shim in that same arm has an Fo of 14 Hz. Considering the low mass arm would the AT-F3, which has similar impedance and output as the DL-103, be a better cart to live with? The DL-103 is an oddity. It shouldn't need a particularly high mass and yet people keep putting them in very heavy arms. There are some CNC machined metal bodies such as the paradox pulse around which have a good following, but still unconvinced. Part of the confusion is that the japanese don't publish the useful compliance (10Hz). compliance measured at 100Hz is actually a measure of the VTF required to meet the tracking spec and nothing to do with resonant frequency. The bigger problem with the 103 is it does put a lot of energy into the arm. http://korfaudio.com/blog26 for measurements. I have a similar issue with my SME 3009 S3 arm which I bought for MM testing but want to try on MC. I have an AT0C9 for it but desperately trying to resist a NOS signet MK111E which is a 5g MC from the late 70s. Low mass high compliance MCs are rare now other than Van Den Hul and they cost too much! AT-F3 is a good cart but will likely be outclassed by your stantons! I had looked at "The Cap" https://www.denonaluminumbody.com/ which has 3.5 g of mass and doesn't require the DL-103's outer shell to be removed. The pulse looks like it has pockets for pellets to add additional weight which is cool but removing the cart motor from the Denon body is not something I want to undertake. With 3.5 g I might be able to get there if I have the right counter-balance weight. As it is now with the Stanton I have plenty of range left. so with arm that's 14.5g, add bolts will be 15, which gives you a horizontal resonance around 12Hz. Sounds perfect without any additional mass. Why not just try the DL-103 in the ADC arm and see what happens. Having useful 10 Hz figures helps. I can go ahead and test it with the ZTX851 preamp and add "The Cap" if I need to lower Fo. With comparative 10 Hz compliance around "10-13" the resulting Fo looks to be more in the ball park. I think I said the Stanton is around 5 g so all things otherwise being equal I think I should be able to counter-balance the added 3-3.5 g of the DL-103. I looked at a Stanton chart and most of the Disco carts ran "10-13" where the Hi Fi carts ranged between "18-30" for the "Stereo Standard" and "Collectors" series. So "10-13" at 10 Hz for the DL-103 doesn't seem out of line. At a minimum I'll know what it sounds like sitting on the arm rest. While I await the cart's arrival I installed the moving coil preamp into the moving magnet preamp's enclosure. ZTX851 balanced moving coil phono preamp mounted in the enclosure. Its a perfect tight fit except for the height of the Wima caps. I'm lacking about 0.1" clearance. If I were to use this box long term I think I'd mount the Wima caps on the underside or switch to the lower profile polyester. If I decide to make another box and return this one to the MM preamp I'd lower the 9 pin D connectors about 0.2"
It measures just as quiet at the end of 50' of cable as it does on the bench. 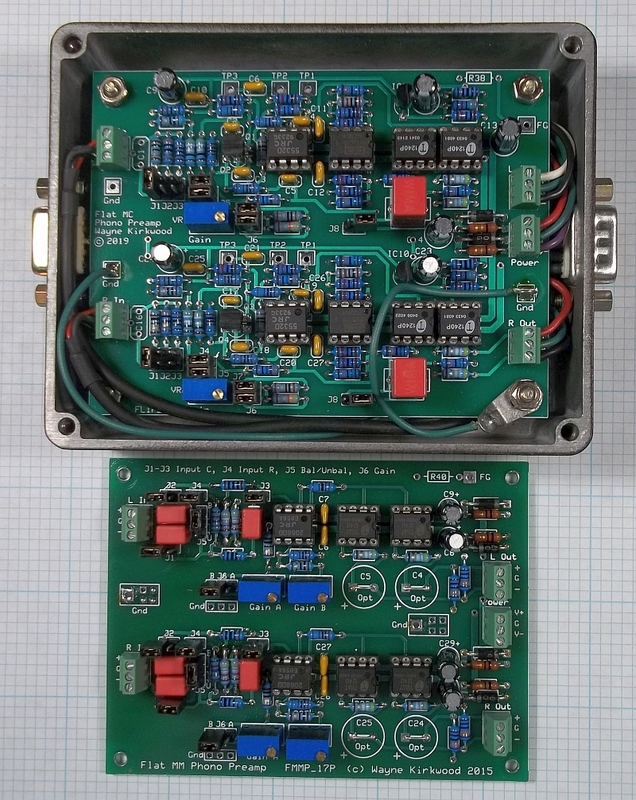 Using the 10Ω terminator as the source resistance and with a 68 dB overall gain (flat) the NF is 1.5 dB.